The AZ series came to replace the Toyota S Series engines in 2000. The first in the displacement range is the 2.0-liter 1AZ-FE engine. Its predecessor is the 3S-FE. The engine includes many advanced technologies for that period. The 1AZ has aluminum cylinder block with cast iron liners. It features offset cylinder and crank centers. The engine got the forged steel crankshaft, fully balanced by eight counterweights. The crankshaft is attached to the block by five main bearings. Between first and second bearings there is a gear driven two balancing shafts in the lower aluminum crankcase. The applying of balancing shafts was a big step in the reduction of engine vibration. Helical gears are made from polymeric material for the reduction of noise. On top of the block, there is aluminum DOHC 16-valve cylinder head. 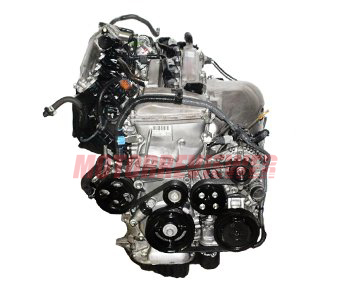 The intake camshaft is equipped with VVTi system (Toyota variable valve timing system), altering timing by 50 deg. A single-stage roller timing chain drives camshafts. The angle between intake valves and exhaust valves is 27.5 deg. Intake valve diameter is 34.0 mm (1.3 in), and for exhaust valve - 29.5 mm (1.2 in). Valve lift is 8.0 mm (0.3-in) for both valve types. There are no hydraulic lifters. The engine equipped with the sequentially injected fuel system. Each fuel injectors has twelve small injection holes (0.18 mm or 0.01 in). The intake manifold is made of plastic. The exhaust manifold and catalytic converter is one unit. The 1AZ engine has higher efficiency and fuel economy, low noise and vibration levels, lightweight and compact design, and excellent reliability compared to the predecessor. The engine has the older brother - the 2AZ-FE engine. The newest 3ZR-FE engine supersedes the 1AZ since 2007. The common problem for the AZ series engine is cylinder head bolt threads wear out in cylinder blocks produced until 2007. Vibration on idle rpm (on 500-600 rpm) is typical for the 1AZ. The JDM engines have EGR system. A clogged EGR valve causes unstable engine revs, lost in power, etc. The 1AZ-FSE engine is susceptible to fuel quality. Bad fuel can lead to the high-pressure fuel pump or fuel injector damages. Toyota doesn't give any chance to rebuild the cylinder block, but it is pretty reliable and long about 200k miles easy. 1AZ-FSE. Direct fuel injection engine version features Toyota's D-4 direct injection system and a compression ratio of 10.5:1. The engine produces 148 hp (110 kW) at 5700 rpm with 148 lbft (200 Nm) of torque at 4000 rpm.